Video: See how easy recycling has become at UB. The Dare to Repair Fair is a community event where individuals can bring broken items (clothing, small appliances, toys, furniture, etc.) to have expert volunteer "fixers" try to repair the item alongside them for free. While there is no guarantee that an item can be fixed, participants are sure to learn something new and have fun along the way. It's not just about fixing things, it's about reducing waste and building community! This event is part of an ongoing series! Our speakers will present on the work they are doing to chip away at the linear consumption economy model. Their innovative ideas are permeating into a variety of spaces, from the factory to frontline communities, where the implications of climate change, waste, and social inequity ar manifesting themselves in acute ways. 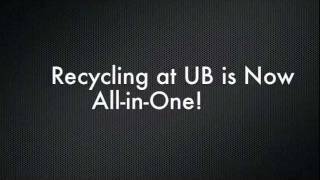 Recycling on campus is easier than ever with single-stream, “all-in-one” recycling at UB. Now, you don’t have to sort recyclables by glass, plastic or paper. Just toss it in one of the specially marked “All-In-One” bins located across campus. And it’s not just easier. It will also reduce the amount of materials going to landfills. That goes for batteries, too. UB began recycling three types of batteries long before a New York State battery recycling policy was implemented in 2011. UB Faculty and Staff--looking to get rid of that old desk, chair, or filing cabinet, but don't want to just see it go to waste? Consider listing the items on the UB SWAP page--it's like eBay for state property that still has a little bit of life in it! UB has created a strategic plan to move the university toward Zero Waste. Our goal is to reduce the amount of physical waste that is produced across our campuses. The plan specifically focuses on how to improve UB’s campus-wide recycling diversion rate and expand composting opportunities. 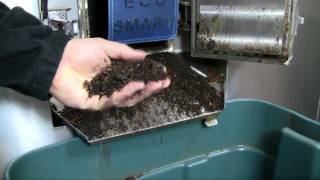 Video: Composting 600 pounds of food waste daily! Food scraps take on new life at UB, where an innovative composting program has been in effect for several years. UB’s decomposer system processes well over 600 pounds of food waste each day, producing 43,000 pounds of soil amendment each year. The university encourages the public to stop by the Statler Food Commissary to collect compost. Hydration stations located across campus at UB allow us to make a choice--refilling reusable water bottles with fresh Great Lakes water instead of buying bottled water. Check out the map below to see where you can fill your bottles! UB is constantly examining ways to conserve energy. For example, residential dining centers are trayless. By not using trays, UB saves on the amount of energy and water required to wash trays. The UB Solar Strand is reducing the university’s carbon footprint by using renewable energy from the sun to power the equivalent of hundreds of student apartments on campus. Here’s something else you might not know: UB is the largest purchaser of wind energy in New York State. And our nationally recognized energy conservation program saves more than $10 million a year.